We open with a child, maybe ten years old, as he runs through a cornfield and is then ambushed by his twin brother. They play games like hide and seek outside together and we get the sense that they are inseparable. When Elias and Lukas (played by real-life twins Elias and Lukas Schwarz) return to their home, they find that their mother (played by Susanne Wuest) has come back from the hospital after surgery that has left her face heavily bandaged. Noticing a drastic change in their mother’s demeanor, the twins take on the notion that this woman may not be their real mother and take substantial action to gain the truth. 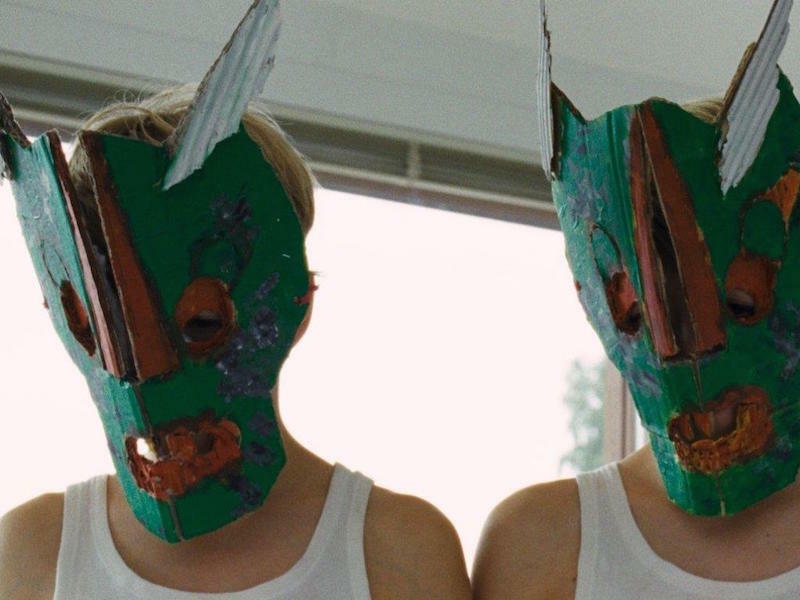 Put simply, psychological horror is rarely as unshakable and unsettling as Goodnight Mommy. Most films in the genre tend to over-explain their material, especially in the third act, but don’t come into this movie expecting expository flashbacks or heavy-handed voiceover narration. This is a film that is almost gleefully loaded with ambiguity, one that respects the intelligence of the audience and invites speculation on nearly every aspect of its story. Even as I’m writing now, I’m questioning the myriad of details that were presented during my viewing and trying to factor them into the larger context of the narrative. But Goodnight Mommy also isn’t trying to outsmart its audience either; this isn’t typical puzzle box storytelling that requires a second watch to figure out what’s happening. With the exception of a few impressionistic scenes that seem to happen out of time or a strict sense of reality, the story is told with clinical precision and is kept to just a few characters and locations. Co-directors Veronika Franz and Severin Fiala wisely forgo scenes of backstory that would too overtly explain plot points that are much better left up to interpretation. They also understand that the absence of stimulus can be much more terrifying than too much. The sound design and music score by Olga Neuwirth are both brilliantly sparing, neither giving into the easy moments to jolt the audience but rather staying out of the way as tension builds organically in each scene. Even the chilly looking lake house where the characters reside seems devoid of any decorative sentimentalities that would seem vaguely comforting. Even the film’s final shot, which I wouldn’t dare spoil, had me wincing away from the screen not because I was expecting a final scare but because it was so relentlessly creepy in a hauntingly simplistic way. I should note that due to the deceptive nature of the trailer that was released for this film (which has incidentally received quite a bit of attention), I have instead linked to a short clip in the image above instead of linking to a full-length trailer like I normally do. It seems that American film distributors still struggle to marketing foreign films faithfully but on the other hand, perhaps it’s enough to give Goodnight Mommy a larger audience than it would not have had otherwise. It’s certainly worthy of one.